The Green Papaya Sangha is going on a vacation to ripen a bit. We will meet again on Thursday, May 3rd at 7:30 pm at the Yoga Tree. Relax. Breathe. Enjoy. See you in May. The Yoga Tree and the Green Papaya Sangha welcome Ajarn Sundara, one of the first women to ordain in the Thai forest monk tradition, this Thursday, February 1st at 7:30 pm at the Yoga Tree. Ajahn Sundara is French and was born in a liberal non-religious family. After studying dance, she worked and taught for a few years in that field. In her early thirties she encountered the Dhamma through Ajahn Sumedho’s teachings and a ten day retreat that he led in England. Her interest in Buddhist teachings grew, and in 1979 she joined monastic community of Chithurst Monastery where she was ordained as one of the first four women novices. 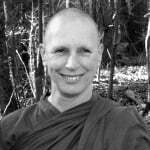 In 1983 she was given the Going Forth as a sīladhāra (ten precept nun) by Ajahn Sumedho. Since then she has participated in the establishment of the nuns’ community, and for the last twenty years has taught and led meditation retreats in Europe and North America. As of 2011, she lives at Amaravati Buddhist Monastery. “There is nothing else filling your mind as you chew — no projects, no deadlines, no worries, no ‘to do’ list, no fears, no sorrow, no anger, no past, and no future. There is just this meal.” –Thich Nhat Hanh. Join the Monday Mindful Meal at Free Bird Cafe with the Green Papaya Sangha. We will enjoy this meal in silence, mindful of each bite, aware of the people and elements that resulted in this delicious meal. This coming Monday, January 29, at 6 pm. Minimum donation for the buffet is 350b, 100% vegan. Menu: There will be a Shan salad, fritters, (sometimes they are fried pumpkin or pennywort or black beans, etc in a batter of chickpea flour) a curry and rice or a noodle dish. Water to drink. Please book your meal in advance at Free Bird Cafe where we will note your name upon payment. We plan to make this a monthly event if there is enough interest and the menu will change every month. As always at Free Bird Cafe, 100% of the profits from the meal are donated to Thai Freedom House, a language and arts learning center for refugees from Burma. This Thursday, January 25th at 7:30 Phra Panlop will be joining us. He will be giving some brief remarks followed by a question and answer period. So please bring your questioning mind! Phra Panlop is an ordained Thai monk and abbot of Wat Dhammaram in Li, Lamphun, a temple he established in the tradition of the Thai forest masters. Phra Panlop was a close student of Ajahn Maha Bua, an outstanding meditation master, Dhamma teacher, and key figure in the Thai forest tradition. Prior to his ordination, Phra Panlop worked for international companies and worked abroad. He holds an MBA from Chulalongkorn University. Suffering: Escape, Embrace, or Fix? Ajarn Santikaro first came to Thailand as a Peace Corps Volunteer where he became interested in Buddhism. After completing four years of service he traveled down to Wat Suan Mokh where he ordained as a monk with the Venerable Buddhadasa, one of the most famous and influential Thai monks of the 20th century. Ajarn Santikaro was Buddhadasa’s primary translator. He also translated and edited Mindfulness with Breathing and Heartwood of the Bodhi Tree. Presently Ajarn Santikaro and his wife Jo Marie are stewards of Liberation Park, a Buddhist Dhamma refuge in Wisconsin in the United States. Just a few tickets left. See you Thursday. As Buddhist practitioners, are there things about ourselves that we don’t see? Our Speaker: Carl Samuels is a Dharma Brother. He and his wife have been living in Chiang Mai for 14 years. He is a co-founder of Cancer Connect Chiang Mai, an organization that assists people diagnosed with cancer, and at end of life. Carl is a student of Zen Master Amasamy.